Political intrigue in 16th century England, Elizabeth explores the power struggles and romantic complications besetting the early reign of Queen Elizabeth I. The myriad of characters circling the throne create an often confusing narrative, but the film thrives on a steady current of naked ambition. After the death of King Henry VIII, England is weak and divided along sectarian lines. The ailing Catholic Queen Mary (Kathy Burke) cannot produce an heir, and her advisors, including the power-hungry Duke of Norfolk (Christopher Eccleston), urge her to imprison and kill her half-sister Elizabeth (Cate Blanchett), a Protestant, before she can ascend to the throne. But Mary does expire, and Elizabeth becomes Queen despite having little support within the royal inner circle. Elizabeth's lover is Robert Dudley (Joseph Fiennes), but Court advisor William Cecil (Richard Attenborough) insists that she must marry into European royalty. In addition to Norfolk, many forces plot to take advantage of the young and inexperienced new Queen. Mary Queen of Scot and her mother Mary of Guise (Fanny Ardant), with the aid of the French, plan to move against England. The Spanish and the French envoys pressure Elizabeth into marrying into their royal families, with Henry Duc d'Anjou (Vincent Cassel) a particularly obnoxious suitor. Pope Pius V (John Gielgud) wants to end Elizabeth's reign once and for all, and sends agent provocateur John Ballard (Daniel Craig) to instigate a betrayal. Only the quietly mysterious Francis Walsingham (Geoffrey Rush), an almost self-appointed advisor to Elizabeth, appears to be actively working to protect her interests. An old fashioned costume drama, Elizabeth suffers from an overload of characters prancing around the palaces of Europe in full regal dress, conspiring to further their interests. The script by Michael Hirst condenses too much history and packs so many people into the story that the lid cannot snugly fit, and fatigue-by-too-much-plot threatens to overtake the film. The overcrowding comes at the cost of depth, and apart from Elizabeth all of the characters remain hastily drawn sketches with singular intentions, with barely a mention of motive or background. But the film does succeed as a visual and artistic achievement. Director Shekhar Kapur creates a bustling environment of activity surrounding the royal palaces. There is never a dull moment and never an unoccupied corner, every well-dressed character accompanied by a large entourage of minions, and every palace affording the latest in 16th century amenities as lavish dance and music parties provide temporary distractions from the numerous conspiracies. And when the power brokers of Europe are not busy plotting murders, overthrows and power grabs in their extravagant costumes, they shed their clothes and jump into bed to enjoy physical pleasures, Elizabeth juxtaposing lust for power with uncontrollable carnal desire. 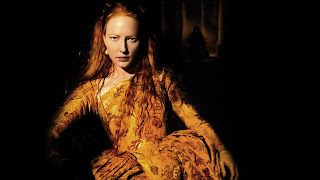 Cate Blanchett rose to international prominence with her turn as Elizabeth, the Australian actress earning a nomination for a Best Actress Academy Award. Blanchett grows with her character, Elizabeth evolving from a friendly and naive girl to a woman with sharp elbows and the fortitude to see off her enemies while dedicating herself to her country. Her performance is filled with understated emotion, Blanchett never surrendering to melodrama, but focusing on the gradually growing strength of personal conviction that every monarch needs to survive. The supporting actors are swamped by their own numbers, and the impressive cast stands aside as the history of overlapping plots comes rushing through. Rush, Fiennes, Attenborough and Gielgud wave at their characters through shorthand, grim and conspiratorial expressions used as substitutes for serious acting. Briskly paced and spaciously photographed despite the mostly interior settings, Elizabeth ends with an imaginative blood-letting reminiscent of The Godfather, the Queen keeping the loyal to one side and separating her betrayers from their souls in a cleansing that sets the stage for her golden era. The raining blood before she reigns for good, so to speak. Elizabeth is structurally flawed, but very sophisticated with some great character development and excellent performances.